This is a sighting over the open ocean. There appears to be no reports from any other aircraft or ships that might have been in the area. The case file is really not very informative. It consists of one single teletype message describing the incident, which involved a C50 aircraft flying eastbound towards California. 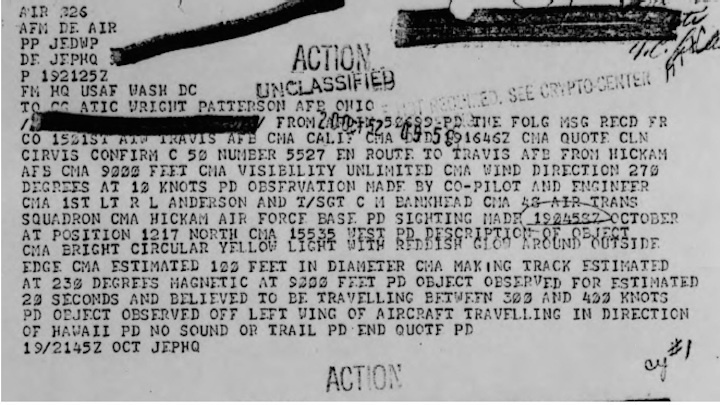 There is another message in the file, which is unrelated to this sighting and involved another aircraft, in another location, at another time. It has no bearing on this sighting. In this sighting, two of the crew saw a bright light with a red glow heading towards the Southwest off of their port wing. It was only visible for an estimated twenty seconds. There is one issue I have with this report. The location of the plane appears to have been wrong. 12 degrees north puts the plane south of Hawaii. The plane was flying from Hickam (on the island of Oahu) to Travis AFB in California. There would have been no reason for the plane to fly south over 500 miles before heading towards California. It is my opinion that the latitude was actually 22 degrees 17 minutes north. This puts the plane roughly 160 miles East-northeast of Honolulu and on a track towards California. The event happened about an hour after sunset and was probably a fireball meteor. The estimated duration is within the expected range for a fireball and it did not appear to deviate from a straight course. There is nothing in this report that indicates it was anything else or that it was exotic in nature. In my opinion, this case should be removed from the “unknown” list and placed in the probable meteor category.